American people trace their ancestry to the original immigrant peoples of Europe, the Middle East, and North Africa along with alleging that they adhere to those ancestral cultural traditions. When asked, they view themselves as being of mainstream "American culture", as if there is such a thing as mainstream culture. In fact, they are often of mixed ancestral descent and follow a melting pot of various cultures. American people and their culture is a variety of expressions due to the United States geographical scale and demographic diversity. A large majority of the American people claim to follow Christianity, whether that be Roman Catholic or Protestant. However, many are at best nominal Christians. American people also adhere to a variety of other religious beliefs including those who claim to be non-religious. Ask God to work in the lives and hearts of American people who have become nominal Christians. 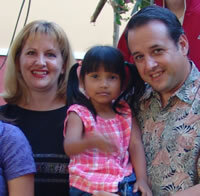 Pray that evangelical Christians will cross cultures to share the message of Christ with their new foreign neighbors. Ask God to work in the lives and hearts of American people who claim no religion.